Huy Fong Sriracha Hot Chili Sauce is delicious, flavorful, and not too spicy. This sauce has a mild to medium burn and adds the perfect touch of flavor to almost anything. It’s a red sauce with a thick smooth consistency. After cooking it into my chicken, it developed even stronger flavors. You could really taste the chili, garlic, and vinegar. I could especially smell the vinegar once I started cooking it, but the overall scent is sweet and spicy. This sauce doesn’t have a lot of ingredients; it has a great mix of each creating a tasty flavorful sauce. 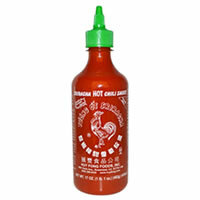 Overall, I really like Huy Fong Sriracha Hot Chili Sauce and would definitely recommend it as one of my favorites. This sauce is dark red in color. It’s a thick but smooth consistency. Huy Fong Sriracha Hot Chili Sauce has a sweet and spicy scent. You can smell the vinegar but it’s not too overwhelming because you can also smell the garlic, chili, and sweetness of the sugar. Mild/Medium spice level. It’s not too hot to handle, but has a little kick to it. Huy Fong Sriracha Hot Chili Sauce has a really unique flavor with a little bit of a burn, but nothing too spicy. 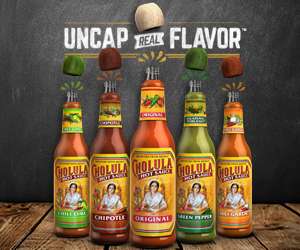 I love the unique chili flavor of this sauce because its different than many other mild/medium hot sauces. It’s hard pinpointing what I love about this sauce, but the mix of ingredients really creates a delicious sauce. There aren’t a lot of ingredients in this hot sauce. Huy Fong Sriracha Hot Chili Sauce basically consists of Distilled Vinegar, Chili Pepper, Water, Garlic, Salt, Sugar, and Preservatives. Obviously the Chili is what brings the spice to the hot sauce, but it also adds a delicious flavor. The sugar adds a little sweetness to the sauce, which evens out the flavor. When I added Huy Fong Sriracha Hot Chili Sauce to cooked chicken and allowed it to cook a bit, it really developed its flavors. You can definitely taste the vinegar, but with the chili, garlic, sugar, and salt, it creates a beautiful mix of flavor that is even more developed once sautéed. The 17oz bottle costs $6.99. That’s a really great price, especially because a little sauce goes a long way. I couldn’t find a guarantee on the website.